Edmonton, Alta. – The incoming class of Western Hockey League alumni may be rookies on UBC’s men’s hockey roster, but goaltender Patrick Dea, and forwards Steven Hodges, Maxwell James and Colton Kehler could end up looking more like veterans on the Canada West scoresheet. 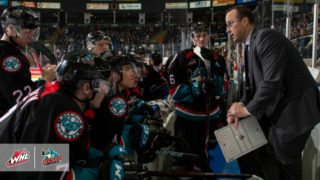 Starting up front, T-Birds coach Sven Butenschon believes his new recruits can have an immediate impact, and for good reason. After all, he just saw Matt Revel and Tyler Sandhu go straight from major junior to UBC’s top lines. 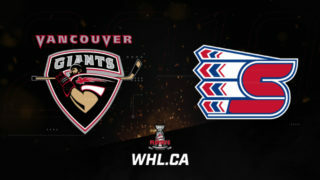 The trio of forward recruits represent a cross-section of attributes, experience, and ability: the six-foot-four, 220 pound James, formerly of the Tri-City Americans, provides UBC some much-needed size and grit; Hodges, who played 247 games with the Victoria Royals franchise, arrives after two pro seasons split between the AHL and ECHL; Kehler is a sniper who led the Edmonton Oil Kings with 32 goals last season. “Historically we’ve had trouble scoring goals at UBC, so it’s defiantly something that we need to improve on,” notes Butenschon, whose team scored 82 times in 28 regular season games last year. Meanwhile, the graduation of Matt Hewitt has left a void between the pipes to be filled by either Rylan Toth, a second-year goalie who played junior in Seattle and Red Deer, or the new arrival Dea. “If Patty comes in and plays the way he’s capable of he’s going to make the decision hard for the coaching staff who’s going to get the start,” Butenschon says. In 2017-18, Butenschon’s first season at UBC, the T-Birds won 16 games – their most in over a decade – and finished fourth in the conference standings before being eliminated 2-1 by Calgary in the best-of-three Canada West quarter-final. Whether the T-Birds rookies make an impact from puck drop, after the holiday break, or not until the 2019-20 season, their day will come. “Everybody’s speed of progress and path of progress is different,” says Butenschon. Butenschon started last season with a long list of potential recruits, crossing off names as time wore on. 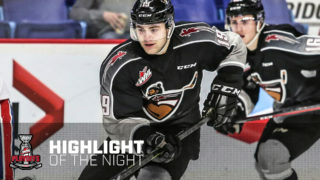 But while other prospects were disappearing from the list, Dea made his name eraser proof, elevating his play with the Tri-City Americans last spring. 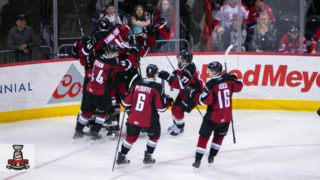 After four seasons with the Edmonton Oil Kings, Dea posted a career-high 22 wins for Tri-City in 2017-18, then backstopped the Americans to the conference final, going 9-4 in the post-season. The opportunity to challenge for UBC’s starting netminder role was doubtlessly enticing for the native of St. Albert, who was impressed by the Vancouver campus where he will study business. Every year 100s of former WHL players attend Canada West institutions, putting to use their WHL Scholarship money. 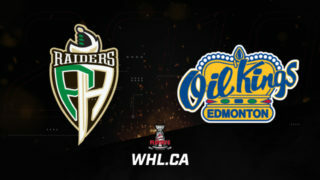 Last season 150 former WHLers skated for one of eight CW men’s hockey teams, including 49 in the CW Final. 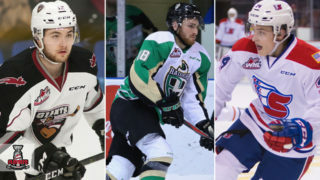 As part of the WHL and Canada West’s ongoing partnership, the WHL powers CW series highlights the latest crop of former WHL recruits, who will make the most of their scholarship package at a CW school of their choosing beginning this fall.